What is the Extraction Rate? Extraction rate (ER) is the amount of white flour that is extracted from a given weight of clean and conditioned wheat. It’s expressed as a percentage of the wheat entering the first break rolls in a roller milling system. Aside from size reduction and standardization, another purpose of the dry milling process (perhaps the most important for business profitability) is to extract as much of the endosperm as possible in the form of white flour without sacrificing too much of the endosperm in the bran fraction. This means separating, as fully as possible, the outer bran coating, aleurone layer, and germ from the endosperm. Complete separation of the bran, endosperm, and germ can never be achieved by the dry milling process. As a consequence, the theoretical yield of approximately 83% flour (or 100% pure endosperm) is never achieved. In practice, extraction rate values of 72–76% are normally obtained in efficient mills depending on the class of wheat used. Higher extraction rate values (>83%) will always mean a greater proportion of bran particles in the resulting flour. The chemical composition, physical appearance, baking performance and dough handling properties of a given wheat flour depend on its extraction rate (ER). As long as the ER is below 100%, the composition of the flour will always differ from the composition of the original grain. Lower breadmaking quality or performance of flour. 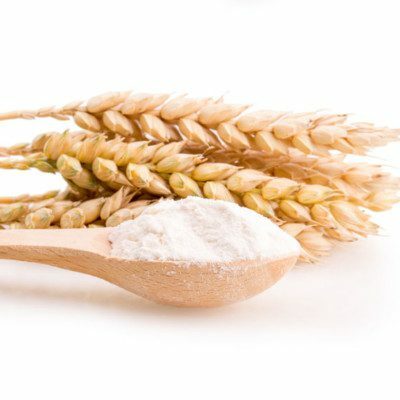 The presence of bran disrupts the gluten-protein matrix (causing less mixing tolerance and stability of dough), weakening dough properties and reducing gas retention capacity of dough during fermentation. Reduced volume of baked bread. Higher ash content and darker flour (more bran and germ particles “contaminating” the white endosperm). Higher total protein content as the outer layers also have protein (particularly non-functional or non-gluten forming protein). Higher levels of non-starch polysaccharides (e.g. fiber materials such as hemicellulose or arabinoxylans, β-Glucans). These play a major role in water absorption. Higher water retention (binding) capacity, which means more water is needed to produce a dough of standard handling properties and consistency. Higher the enzymatic activity (i.e. higher protease, lipase and amylase activity). Shorter shelf-life of flour (e.g. oxidative rancidity). Higher microbial load. All pericarp or bran layers (especially those exposed to ambient conditions) remain in the finished flour. Higher nutritional value of flour. 72.0 (soft wheat) 10.5–12.0 0.48–0.58 Lower than clear Higher than clear Produced by separating the maximum amount of starchy endosperm from the bran and germ. Blend of all flour streams obtained after milling, sieving and purifying. Usually destined to all-purpose (family) flours. (Straight Grade – Patent = Clear). Compared to straight grade flour, clear flours have a darker color, more ash, higher protein, and a stronger flavor. Used in dark breads (variety and hearth bread). value Obtained by selecting some of the streams produced. Millers only use the high-grade streams with the whiter color, generally from the first section of the reduction system. A patent flour is more costly for bakers than other flour grades. Excellent for white bread and buns. Whole wheat flour 100.0 9.0–14.0 1.5–2.0 Highest Lowest No separation of kernel components is done; only size reduction of grain is carried out. Used in variety and sourdough bread. * Values reported on a 14% moisture basis. Eliasson, A.C., and Larsson, K. “Flour.” Cereals in Breadmaking: A Molecular Colloidal Approach, Marcel Dekker, Inc., 1993, pp. 241–256. Cauvain, S.P. “Wheat Milling and Flour Testing.” Technology of Breadmaking, 3rd edition, Springer International Publishing Switzerland, 2015, pp. 339–373. Posner, E.S. “Wheat Flour Milling.” Wheat Chemistry and Technology, 4th edition, AACC International, Inc., 2009, pp. 119–141.